My husband was one of the principal sponsors on the wedding of a former office mate which was held last January. He went home with a 29-oz can of Almond Roca® Buttercrunch Toffee, the couple’s wedding giveaway for their principal sponsors. The little boy couldn’t contain his excitement, and he wanted the sealed tin can of Almond Roca opened right away, but Mommy wouldn’t let him. If I can prevent him from eating sweets, I would. 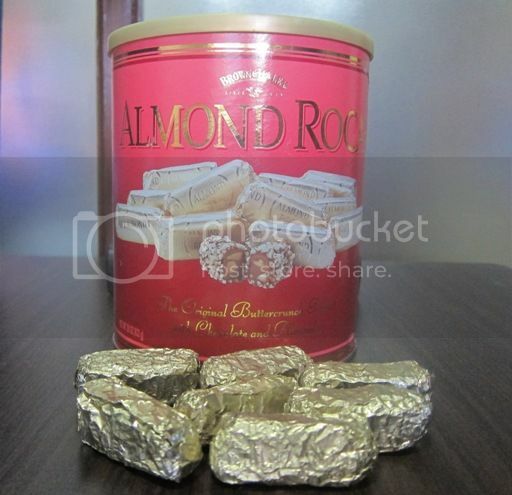 It took a few days before he was finally able to taste the creamy, buttery and chocolatey goodness of Almond Roca. My little boy loved the taste, but since he lost his two lower front teeth more than a month ago and his two new teeth are just starting to grow, he was having a difficult time biting and chewing these delicious sweet treats, so we ended up giving away most of the Almond Roca Buttercrunch Toffee to his classmates and teachers, to his lolo and lola and to some of my mommy friends in my son’s school. This entry was posted in Almond Roca, Confection, Dessert. Bookmark the permalink.